Here’s a shot of a butterfly that I chased for several minutes through the campground last week. There were storm clouds moving in, and I was trying to get a decent shot of this guy before the rain started. He finally settled on this patch of flowers and stayed put long enough for me to get several shots with my telephoto lens. It wasn’t until later when I was viewing the shots on my computer screen that I noticed that his right wing was torn. Poor guy! Anyway, I was thankful that he offered to pose for me for a few seconds just before the rain started. This was shot in raw NEF format, converted to JPG and processed in Paintshop Pro X3. 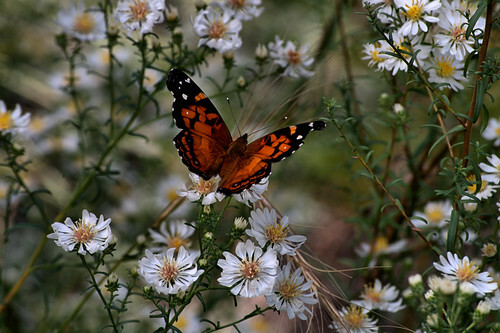 This entry was posted in Processing, Shooting and tagged animal, Arizona, AZ, butterfly, camera, campground, Canyon Point, D5000, Nikon, Paint Shop Pro, Photomatix, software, wildflowers, wildlife. Bookmark the permalink.